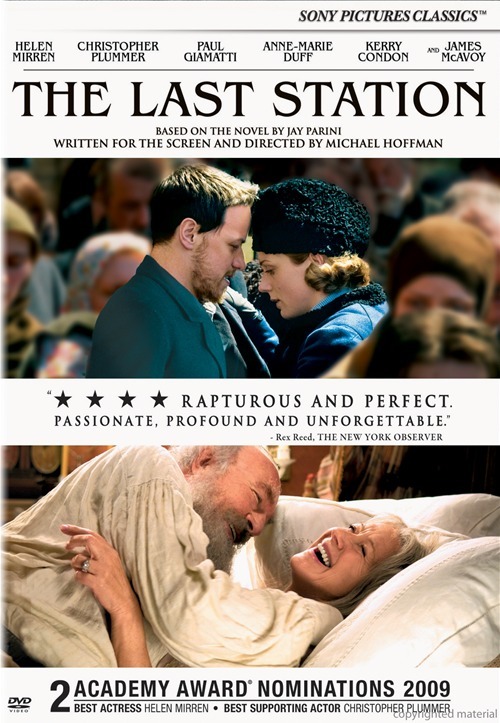 Michael Hoffman, (Soapdish, Restoration) writer/director of the drama The Last Station (Sony, DVD $19.94, Blu-ray $24.95, released June 22, 2010), is a big fan of DVDs and their special features. 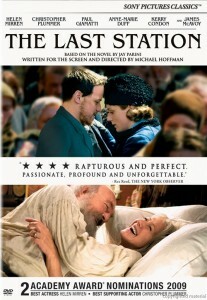 In fact, The Last Station, a biography movie that examines the final days of famed Russian novelist Leo Tolstoy and his long-time wife Sofya Tolstaya, comes fully supplemented on DVD and Blu-ray with featurettes, commentaries and even a gag reel, which is surprising given what a serious film it is. Hoffman spoke to Disc Dish about his appreciation of the digital form of home entertainment. Hoffman: I do enjoy commentaries. For me, it’s a kind of journey back through the process of making the movie. Every scene evokes a memory and that triggers other memories and you recall the entire production. All of sudden, the film transforms into a kind of home movie. DD: There are actually two tracks on the disc, one for you and the other for stars Christopher Plummer (The Imaginarium of Dr. Parnassus) and Helen Mirren (The Tempest). Hoffman: The two of them have more than enough to talk about on their own. Having worked on the movie for five years, there were things I wanted to talk about my end of it. DD: There are also a handful of deleted scenes included, something like 13 minutes of material. Hoffman: They’re a result of a lot of editing, which is usually the original of excised material. When you look at the deleted material, it informs you on how the movie became what it became. In the case of The Last Station, the movie became centered on love and marriage, and the excised material didn’t serve that end. None of the scenes were deleted because we didn’t like them, they just didn’t work. DD: So, it’s a bit disappointing, but at least audiences can still see them in some form. Hoffman: Yes. Actually, my favorite scene in the film is one that didn’t make the final cut. But I crammed parts of that scene into the movie in other ways—as a flashaback, a fantasy. And in the deleted materials, as well. DD: Okay, and now one question about the film proper: I read in another interview you had given that after reading the novel The Last Station, you had to let the idea of making the film gestate for several years before you were up to moving ahead with it. Hoffman: Well, I read the novel for a second time in 2004 — I had originally read it years earlier — and I saw it as more a film about love and marriage then I did as a straight biopic about Leo Tolstoy. After I wrote a first draft of the screenplay, it moved toward what a friend of mind calls ‘the tragic comedy of marriage.’ And that’s what marriage can be. I look at my own marriage and some of what you do is just so silly and counterproductive, even when the love is all there.